The men’s 100-meter dash, the most anticipated event of the 2024 Summer Olympics, is moments away. You settle into your front-row seat. The starting gun goes off and the world’s fastest humans sprint toward you. They lean across the finish line in quick succession, then the gold medal winner celebrates. He appears close enough to touch. You reach toward him, hoping to offer a congratulatory handshake or hug or high-five. It is the experience of a lifetime. And thanks to virtual reality, it could be your experience, whether the Games take place in Boston, Paris, Rome, Hamburg, or Budapest. By 2024, if technology has progressed as developers in Silicon Valley expect it will, virtual reality could put spectators in the middle of Olympic action while they sit in homes around the world. No expensive tickets, no traffic jams — just the high-tech hardware necessary to watch sprinters speed through your living room, swimmers send spray inches from your face, and gymnasts flip above your head. With its variety of individual sports, short-duration competitions, and global audience, the Olympics appear an ideal fit for virtual reality. Individual sports offer the greatest potential for truly immersive experiences. Then, once immersed, viewers could bounce from a 10-second sprint on the track to a three-minute freestyle relay in the pool to a 90-second floor routine in gymnastics. The relatively short bursts of action help fans avoid the sensory fatigue that can come with more than 30 continuous minutes of virtual reality exposure. Unlike Major League Baseball teams with 81 home games every season or NBA teams with 41, there will be limited opportunities to see the 2024 versions of sprinter Usain Bolt, swimmer Michael Phelps, or gymnast Aly Raisman compete for gold. When you factor in the prohibitive costs and complicated logistics of attending the Olympics, virtual reality could appeal to fans who want to be there, but can’t go or get tickets to the high-demand events. By 2024, home viewers with headsets likely won’t miss much, if anything. The virtual Games experience could include a scenario where you watch from Boston or Chicago or Miami while friends from around the country and even around the world virtually join you. Also, it could engage almost all of your senses. Outside the country’s high-tech centers, a virtual Olympics might sound as fanciful as Boston 2024’s walkable Games. But it’s not. The Olympic Broadcasting Services, the official IOC agency responsible for the competition footage used by international networks, has said it will explore potential virtual viewing opportunities at the 2016 Rio Games, though experts noted that likely will mean post-event highlight packages with limited testing of live coverage. Already, live virtual viewing has been tried in the Olympic sports of gymnastics, golf, and basketball. At the 2014 Commonwealth Games in Glasgow, the BBC captured gymnastics footage with a 360-degree camera and transmitted it in real time to a headset at the Glasgow Science Centre located a half-mile away from the competition. 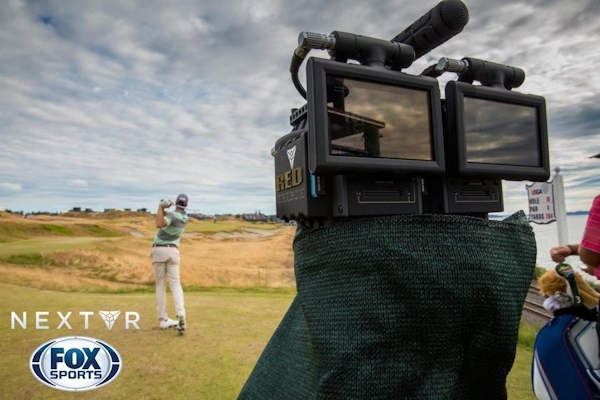 In June, NextVR, a California-based technology company at the forefront of live virtual reality experiences, partnered with Fox Sports to deliver live streaming virtual coverage of the 2015 US Open golf tournament. To create the virtual US Open, NextVR placed five camera rigs at popular vantage points, including one set up 15 feet from the 18th hole that put viewers on the edge of the green. The tripod-mounted, shoebox-sized rigs captured play from 180-degree and 360-degree cameras. Then, footage from the cameras was streamed wirelessly to headsets. Throughout the tournament, fans visited VIP hospitality tents near the course, put on headsets, and immersed themselves in the action, moving virtually from hole to hole. At Fox Sports viewing parties in New York, Los Angeles, and Vancouver, virtual spectators enjoyed the same experience. At the US Open, NextVR executive chairman Brad Allen watched VIPs try the company’s technology. He said golf enthusiasts were “beside themselves” with the virtual views, particularly one man who put on a headset for a look at golfers teeing off on the 16th hole. While headsets and home setups could be commonplace by the 2024 Summer Olympics, gathering places for virtual viewing could still be enticing options. Imagine you have tickets to a morning track and field session and early-evening weightlifting, but want to make it a day at the Games and watch a US basketball game. Without a ticket to the game, maybe you pay $50 for a pass to a virtual viewing tent near the Olympic Boulevard. In the NBA, the Sacramento Kings experimented with virtual reality last season, working on ways to transport headset-wearing fans from various parts of the arena to the owner’s courtside seats. Kings president Chris Granger values how virtual reality could expand the team’s reach in the seasons ahead. Certainly, plenty exist for all Olympic events. Virtual reality experts see a worldwide Olympic audience ready to tune in, and a wide variety of options. Coverage could come from everywhere — live events, behind the scenes, the competitors’ perspective, and camera rigs placed in the Athletes’ Village. And even more than real-life spectators, virtual reality viewers could have their own, unique Olympic experiences. At the virtual Games, if you want to follow the Spanish runner in fifth place or see a close-up reaction of the French swimmer who failed to qualify for the finals or continually switch between a handful of events and viewpoints, you can. Or, you can turn around and look at the crowd behind you without worrying about the mad dash for the exits when the competition ends or the crowded subway ride to another venue. Before fans can join virtual crowds at the 2024 Summer Olympics, progress must be made in the real world. For starters, 360-degree cameras need to capture even better-looking footage and become more compact so they go essentially unnoticed by athletes and ticket-buying spectators. Headsets need to shrink, too, so they are easier to carry around and use with smartphones because it’s likely consumers will demand that kind of portability. And companies are working on all that. Venues also need to be designed with virtual reality in mind, taking into account new camera positions placed in the middle of the action. Maybe future Olympic arenas come with special dolly tracks or above-head wires or designated drone flying zones for cameras that could take viewers along the flight of a javelin or off a diving platform. But while virtual reality could lure in exponentially larger audiences, the stadium experience and space athletes require to compete cannot be compromised or forgotten. Ticket-buying spectators don’t want to sit in seats with views obstructed by 360-degree cameras. And athletes don’t want invasive drones mounted with cameras following their every move or cameras placed anywhere they potentially could cause injury. All that presents more challenges for Silicon Valley developers. Either cameras become compact enough to blend into the surroundings or facilities feature places to carefully tuck them out of sight or both. Belch envisions stadiums where you could sink small 360-degree cameras beside the finish line or near the javelin’s landing sector, yet well clear of the competition. Small, 360-degree cameras mounted beneath baskets or inside goals or atop horse jumps could work, too. Just like with traditional broadcasts, time and experimentation will help determine the best camera placement for actual and virtual spectators and athletes. Above all, as cameras and headsets improve, sports fans need to buy them. If headsets become as commonplace as televisions before the 2024 Games, then virtual reality makes sense for the Olympics. If they remain high-end devices largely popular among geeks and gamers, then the outlook is different. It wouldn’t make sense for the Games and their broadcast partners to invest time and money in virtual reality when only a fraction of the worldwide audience would be able to watch it.